While Julia was so courageously battling aplastic anemia, she was keenly aware of the other children that were also struggling to survive. What impacted her the most was the reality that some of these children were often without their families by their side. The unfortunate reality is that aplastic anemia is a hematological disease and hospitals do not have the financial resources to assist families. Julia’s Wings Foundation was created in loving memory of Julia to raise awareness of this disease, financially assist families, and fund medical research. Julia is our greatest teacher… Before she suddenly became ill at the age of 12, her character exemplified all that is good. Julia was the one who did the “right" thing when no one was watching. Her heart was larger than life. She would help a friend in need, a stranger in need and had such a solid grasp about what truly mattered in life. She was an amazing daughter and sister, an incredible athlete and student. Julia was a loyal friend to many… an amazing soul. 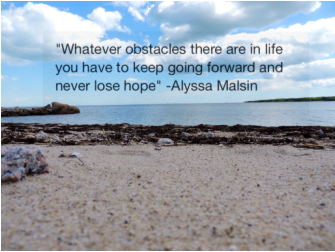 On January 28, 2011 the Malsins world was shattered as Julia was diagnosed with severe aplastic anemia, a rare bone marrow failure disease. She courageously fought this disease but ultimately passed away in her parent’s arms surrounded by family in the ICU at Boston Children’s Hospital on January 27, 2012. 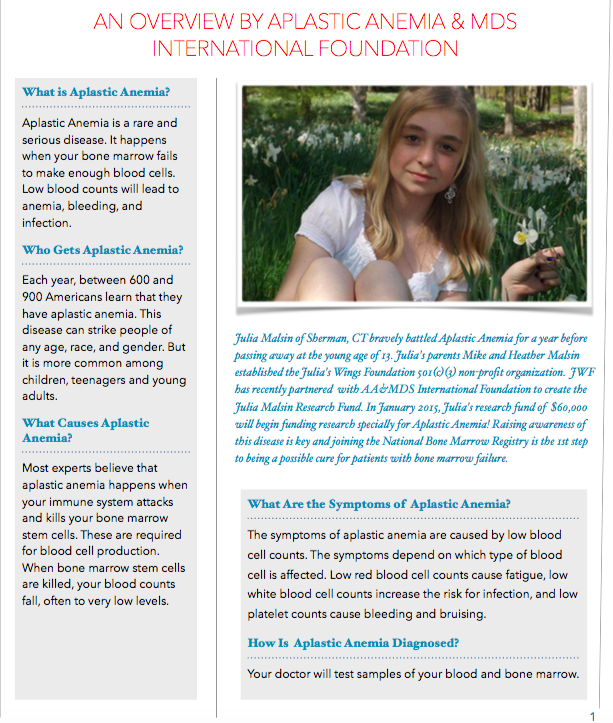 The Aplastic Anemia & MDS International Foundation (AAMDS) is the world's leading nonprofit health organization dedicated to supporting patients and families living with aplastic anemia, myelodysplastic syndromes (MDS), paroxysmal nocturnal hemoglobinuria ( PNH ), and related bone marrow failure diseases. ​in the lives of these families. Julia's story and JWF's work was featured in the local media!